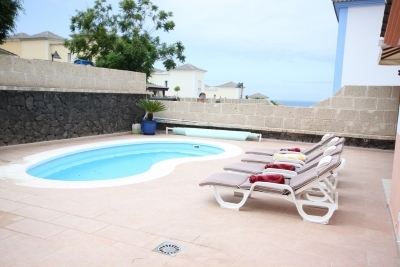 Villa Cheryl is a three bedroom villa with private swimming pool. It is not too far from the beach, only a 15 minute walk and is very close to restaurants and a big commerical shopping centre which includes a supermarket shops and entertainment. The villa also has high speed wi-fi internet, a safety deposit box and a barbeque. Outside there are ample sun loungers as well as a covered terrace providing a chill out area with table and comfortable chairs and a barbeque for alfresco dining. There is also an outside shower which can be handy for washing off sandy feet after a trip to the beach and also a garage. Linen and towels are provided and everything else necessary to spending a nice vacation. The villa is laid out over 2 levels and there is also a safe available for guests to use. A deposit is required to secure the booking. The balance of the booking fee is payable on arrival directly to the owner. A refundable security bond of 300 euros is payable on arrival and will be refunded back to guests before departure, providing there are no breakages.